Manet is a division of Povážské Engineering Works, National Corporation, Povážská Bystrica, Czechoslovakia. 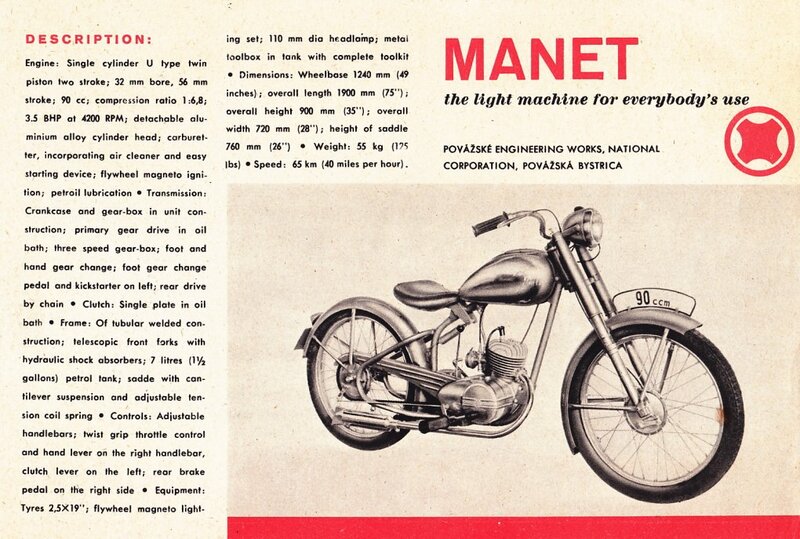 Manet motorcycle history began in 1947 with the production of the M90. 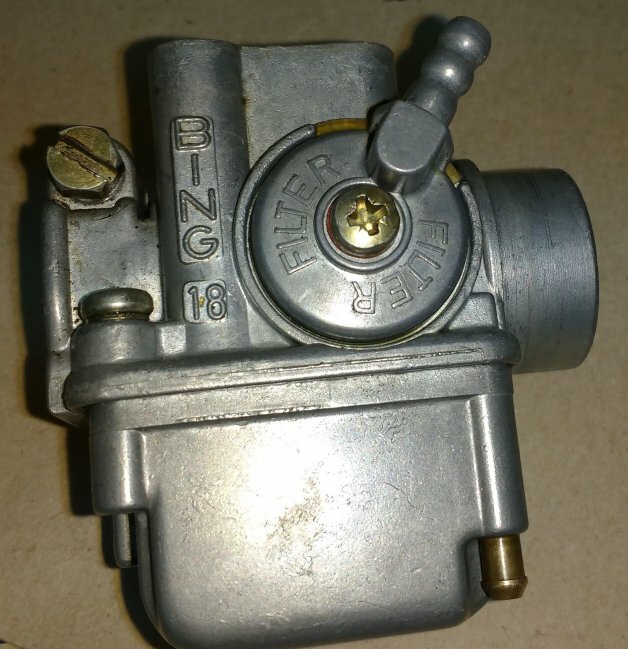 It was a 93cc two-stroke single cylinder but it had two pistons. It produced 2.6kW at 4500 rpm. By the year 1951, when production ended, 37,630 M90s were produced. 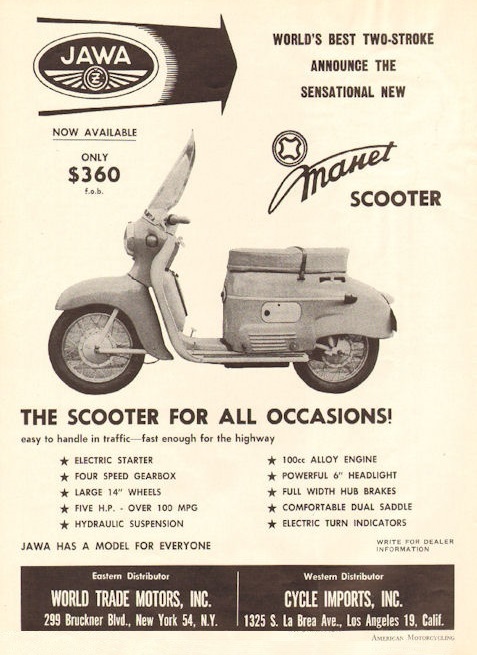 The Jawa-Manet alliance is shown in this 1959 advert for the US-model Manet scooter, “The scooter for all occasions”. It has a 100cc two-stroke 3-speed grip-shift engine. “Fast enough for the highway”. Red star is where ’94-06 Manet and pre-’86 Jawa mopeds were made. Green star is where 1986-1995 Jawa (Babetta) mopeds were made. Before the 1990’s, all Czechoslovakian companies were nationally owned, and so their names appear together in ads, like CZ, Jawa, Babetta, Manet and others. Starting with the fall of socialist economies in 1990, and the privatization of industries, many companies faced increasing costs, and decreasing market demand, as Slovakians were free to purchase from outside the country. 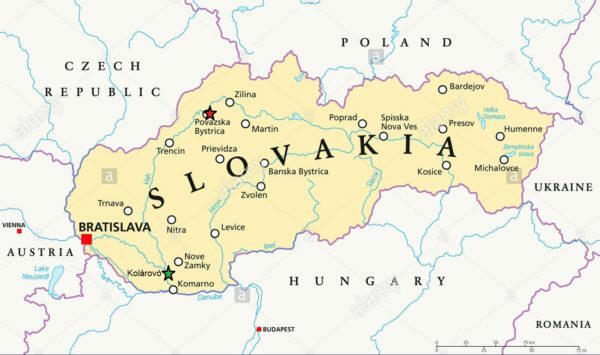 In 1993 Czechoslovakia was split into Czech Republic (now called Czechia) at the northwest side, and Slovakia at the southeast side. The brand name Manet was revived in the privatization and restructuring. The Manet Korado was made in Slovakia by PS Motor Manet from 1994 to 2008, and sold in the US as Puch Korado from 1995 to 1999. It was made in the same factory that pre-1986 Jawa Babetta mopeds were made at, Povážské Strojárne (PS) (Povážské Engineering Works) near the city of Povážské Bystrica in north-central Slovakia. At the same time the first Manet mopeds were made, in 1994-95, the last Jawa mopeds were made in the small agricultural town of Kolárovó, in southern Slovakia near the Hungarian border. While the Manet Puch Korado was made with Piaggio top notch equipment and modern methods, the last few years of Jawa’s were made using obsolete, worn-out equipment with not enough expertise and concern for quality. 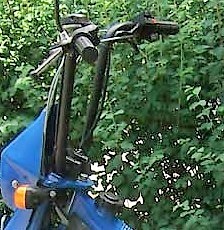 After Puch closed it’s doors in 1987, the moped production equipment was sold to Maxwell, in Turkey, Piaggio, in Italy, and Hero, in India. 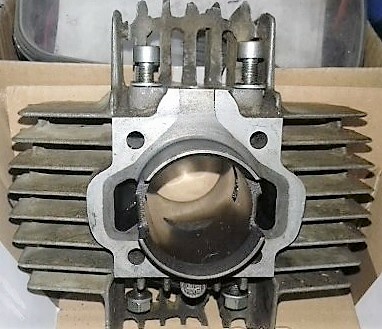 Puch had developed the Super Maxi, with a catalytic exhaust, an improved right-side air filter, and an improved cylinder with 4 transfer ports and a boost port. 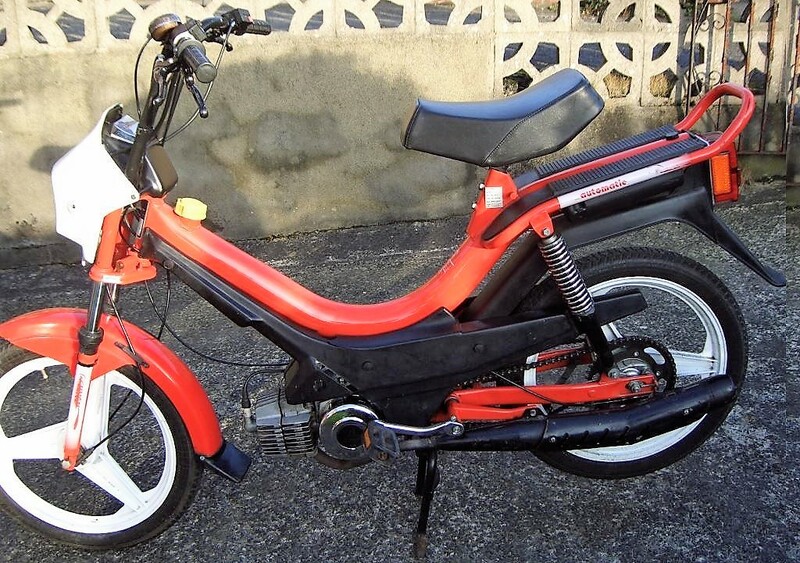 Maxwell in Turkey produced Puch Super Maxi remakes, but they had quality issues, and were not successful. Puch had developed the advanced Maxi Plus (Austro-Daimler), with help from Ferdinand Porsche. Hero produced Maxi Plus remakes into the 2000’s. 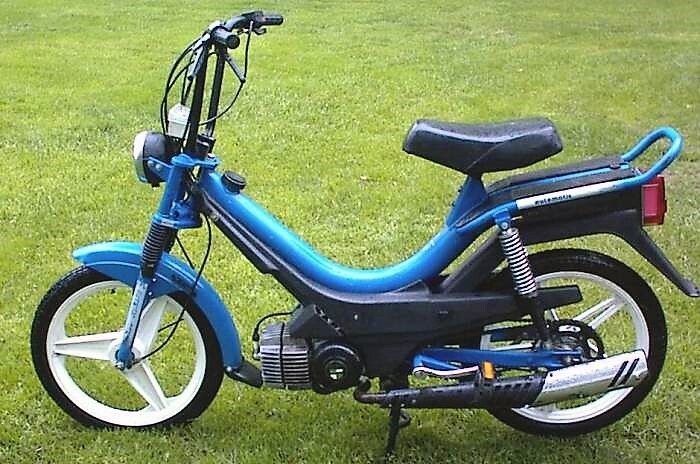 Piaggio produced Puch Super Maxi remakes in Italy until 1997. Piaggio then sold the Puch rights and engine production equipment to Manet in Slovakia. In 1998 Piaggio destroyed the molds and equipment for making the Maxi. Manet bought the engine production line in 1994, and moved it to Povážská Bystrica in Slovakia. 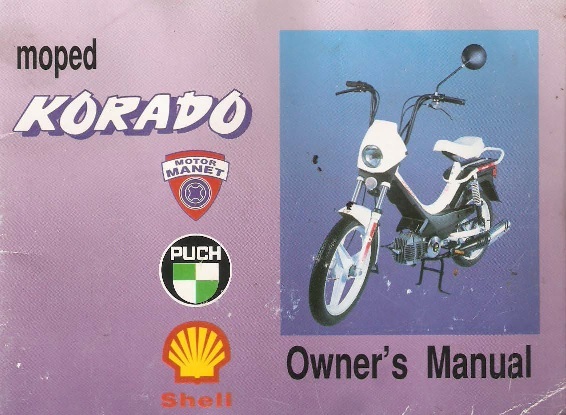 They developed their own frame and moped, called Manet Korado. The first engines were of low quality, but they learned quickly. Here is a translation from http://mpkorado.cz/en/ They are currently an accredited importer of mpKorado scooters, electric bicycles and VCAN helmets for the Czech Republic, since 1994. MP KORADO CZ, s.r.o. imported over 16,500 Manet Puch Korado mopeds, made in Povážské Bystrica, Slovakia, to the Czech Republic from 1994 to 2006. 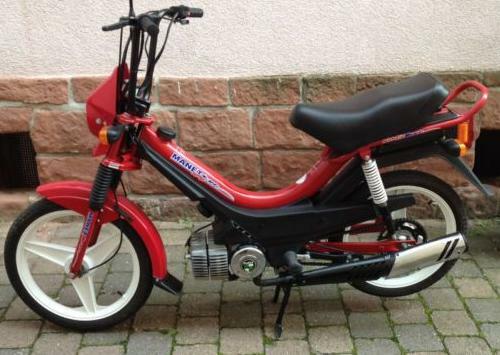 In 1994 the Korado immediately became a very popular means of transport for Czech customers, and disrupted the sales of Babetta (Jawa) mopeds made in Kolarova, Slovakia. It was the best selling machine in it’s category, and contributed the end of Jawa Babetta moped production. Manet Korados were produced in four motor versions, all with one-speed automatic transmissions: Puch Maxi or Super Maxi, pedal-start or kick-start. The mopeds were supplied in six basic colors. By 2006 the factory at Povážská Bystrica stopped moped production completely. Povážské Strojárne Motor Manet transformed into VVED, and produced agricultural light equipment. The flyer at right is screaming the logos and word PUCH, while not mentioning the true maker Manet. 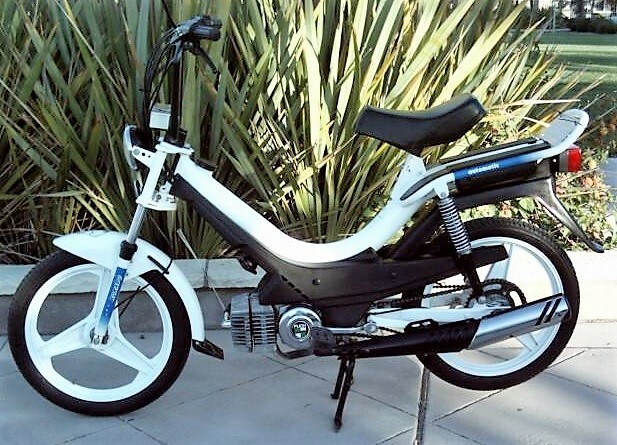 The US models were called Puch Korados. 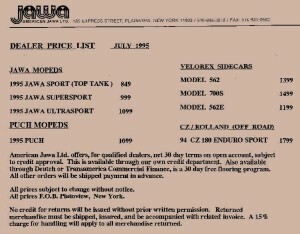 They were imported and distributed by American Jawa Ltd. 185 Express St, Plainview NY 11803. 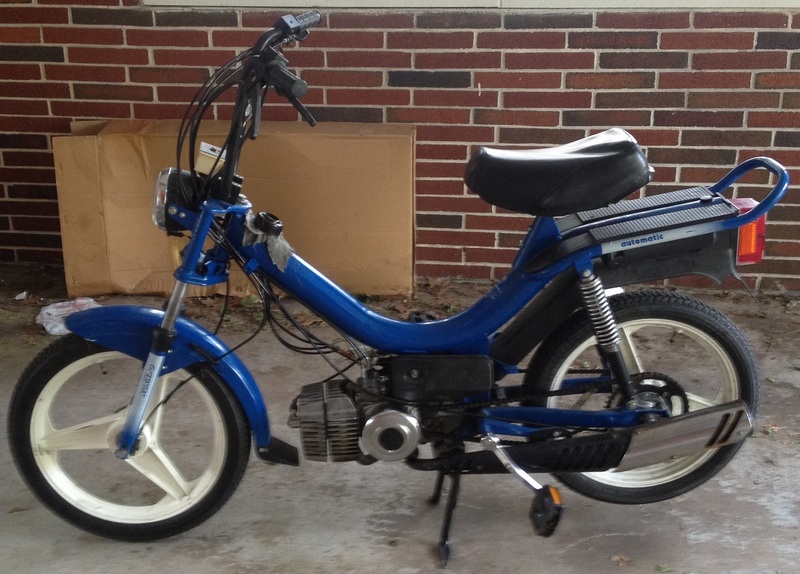 In the late 1970’s Puch was the best selling moped in America. American Jawa knew that many Americans knew the name Puch, or they had one and liked it. Local history: The 1995 suggested retail price for the “Puch” was $1099. 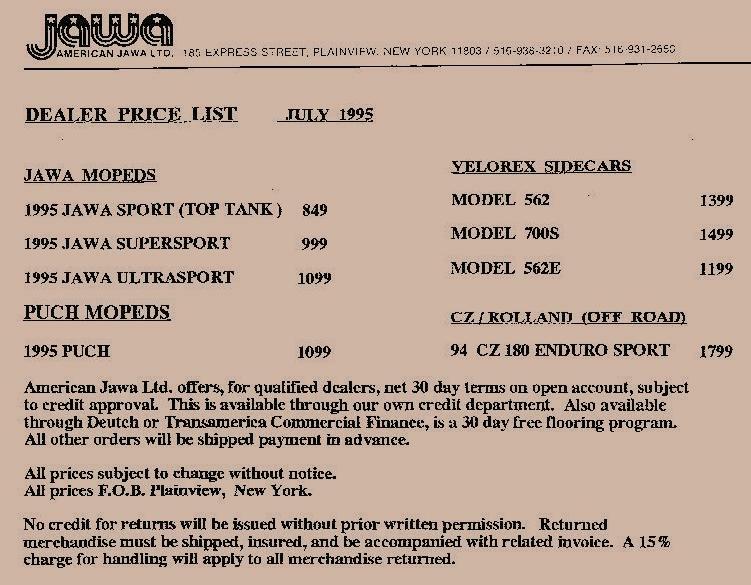 That was slightly more than a comparable 1995 Tomos Sprint for $999. 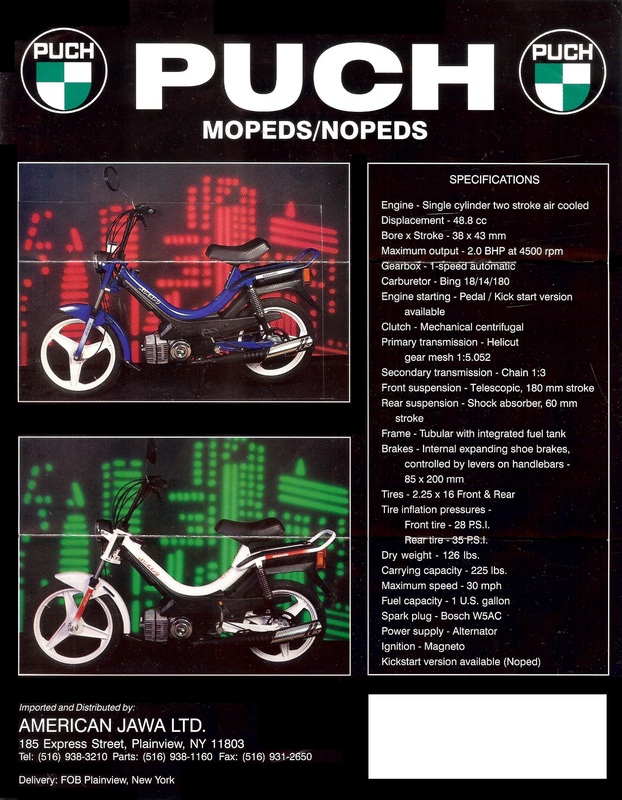 Some of the Puch Korado dealers were Steves Mopeds in Dumont NJ and Mr. Moped in Sarasota FL. 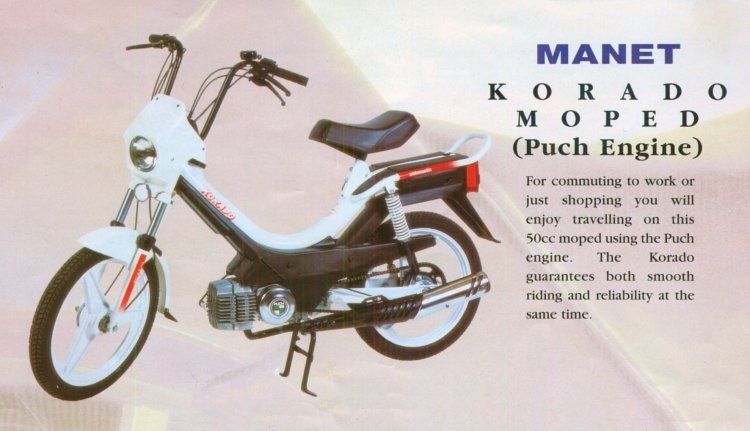 But there were no Puch Korado dealers in California. So there are no Korado-specific parts at Myrons Mopeds. Even though Shaun was actively servicing one or two hundred Southern California mopeds each year, at Royal Cyclery and later at Myrons Mopeds, he did not see a Puch Korado in person until 2009, 14 years after they came out. And that one Korado was brought into California only because the internet, that allowed people to easily buy things from far away places. 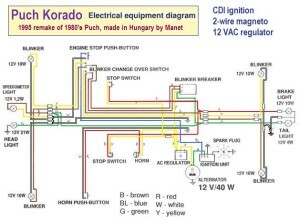 Specifications: The Korado Owners Manual lists specifications. Power 2.0kw (2.6hp), speed 40km/h (26 mph), weight 57.5kg (126 lb) 20lb heavier than a Puch. Speed Versions: Korado engines (cylinders, heads, pistons and cases actually) have two speed versions. Both are 38mm bore, 49cc displacement. Most US and European models have the 2.0kW (2.6hp) cylinder Super Maxi. It can be identified from a distance by the 9 side fins. 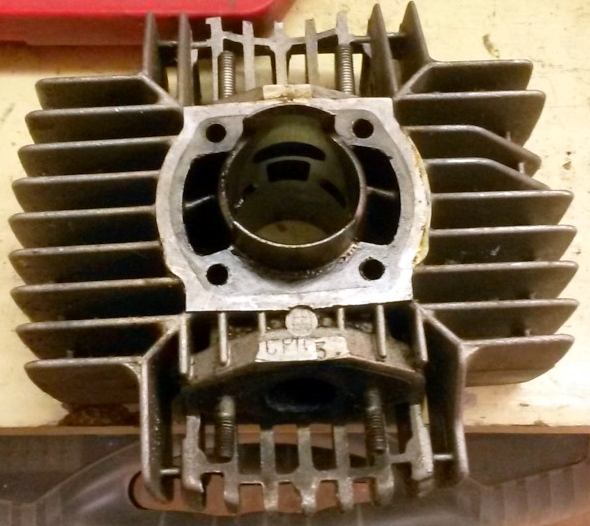 It is like a 1979 Puch Magnum, but the piston has transfer port holes, and the cylinder has way more transfer ports. So it “gulps” more air and fuel with each stroke. Some US and European models have the 1.5kW (2.0hp) cylinder called Maxi. It can be identified from a distance by the 8 side fins. It is exactly like a 1979 Puch Maxi Luxe cylinder. 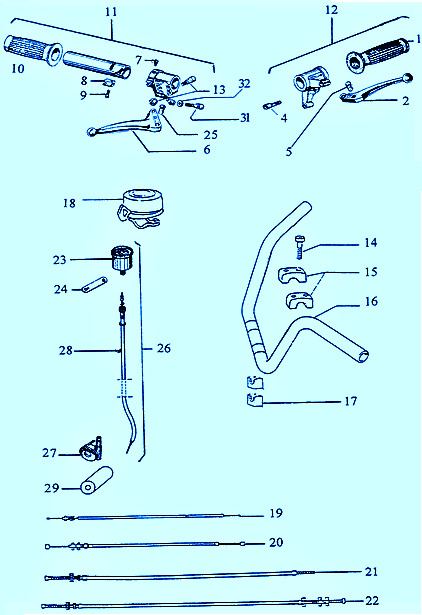 Wheels: The drum brake specified in the owners manual is 85 x 20mm, and tires 2.25 – 16″, like Jawa spoke wheels. From the owners manual photos, the brake arms look like Jawa ones. But none of the 100 or so Manet Korado photos on Google Images have spoke wheels. 97 out of 100 have white Bernardi 3-ray mag wheels, and the rest have other mags. So only the prototype Korado had 16″ Jawa-type spoke wheels. Almost all others have 16″ 3-ray Bernardi wheels, that take Bernardi 90×20 or Grimeca 90×18 brakes. 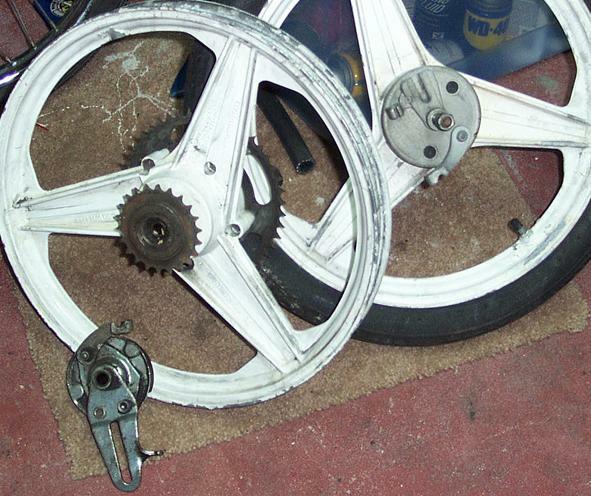 The cast aluminum front brake plate in the photo at right is identical to Puch-made ones for the Grimeca “snowflake” wheels with 90×18 brake drums. So much of the owners manual is out-dated, because things on the bike changed, but the manual did not. There are pedal and non-pedal (kick) versions offered. By the mid 1990’s many European countries followed Germany and dropped the requirement for pedals on mopeds. Many US states followed Europe and allowed “no-peds” to be classified as mopeds (motorized bicycles). 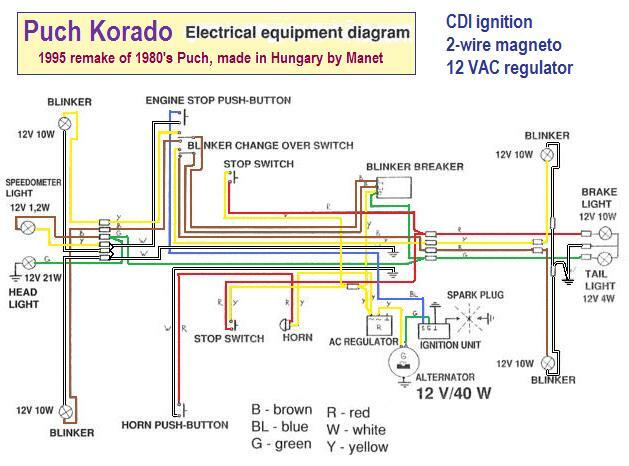 Electrical: There are four Korado electrical systems. System #1 and #2 are for European models with a ring-ring bell and no brake light. System #3 is for Euro models with an electric wrong-answer buzzer and no brake light. Electrical system #4 is the deluxe pizza with all the toppings, for all US models and some Euro models. Identification: US models said Korado, or nothing, on the gas tank. Some European models also said nothing on the tank, but most Euro models said Manet Korado. 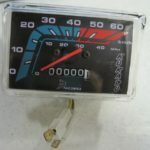 US models all had wiring system #4, with a engine stop button operated by the right thumb. Some Euro models also had that. But only US models have a US-DOT-compliant ID plate, that says “This vehicle conforms to all US safety standards in effect on the date of manufacture above”. And only Euro models have bells and engine stop buttons operated by the left thumb. Euro models with electrical systems 1, 2, and 3 have a different shaped headlight. If you see that, and no red button on the right thumb, it is a Euro model. Compare the 1995 blue with the 1999 blue below. You can tell the speed version from a photo, by the number of engine side fins. Maxi is 8-fin, Super Maxi is 9-fin. 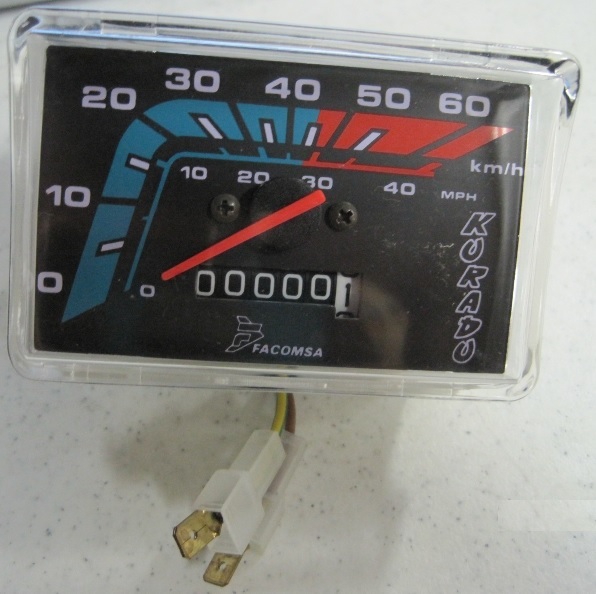 Spare parts for the Manet Korado moped can be obtained from MP KORADO CZ, s.r.o. http://mpkorado.cz/en/ They are an accredited importer of mpKorado scooters, electric bicycles and VCAN helmets for the Czech Republic. On the Czech market since 1994. Spare parts for Korado and Jawa can be obtained from JawaParts.com, since 1992. https://www.jawaparts.com/ But they won’t ship to customers in the USA, for some reason. Myrons Mopeds does not have actual Korado parts, but has many things for other mopeds that are the same. 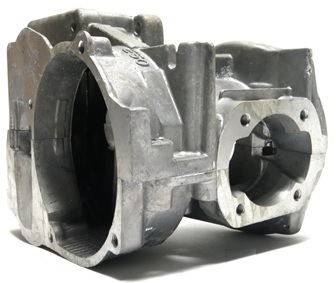 Helical-cut means the gear teeth are slanted. 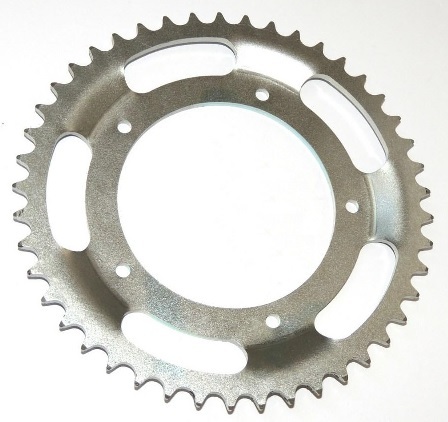 The benefit of helical-cut gears is much less noise or “whine”. The drawback is some of the driving force is diverted to the side. 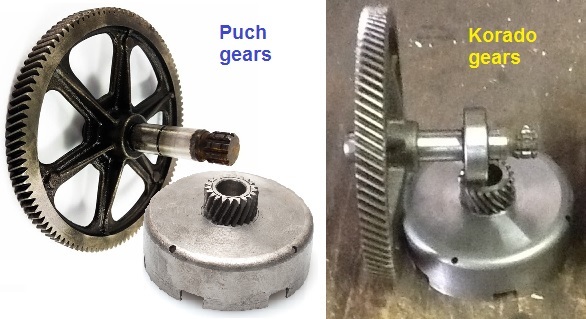 The Korado gears are forced to the opposite side as Puch gears. You are currently browsing the archives for the Manet category.